Hampton Inn - Suites Orlando-East-Univ. 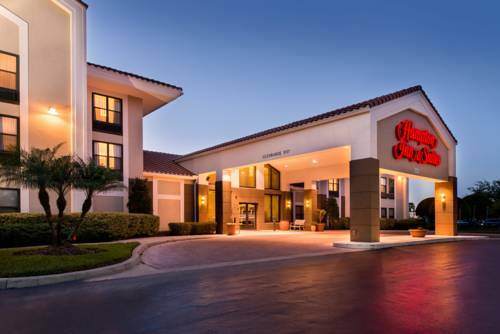 of Central FL hotel is located on the east side of Orlando Florida 2 blocks from the University of Central Florida and next door to the Siemens Office Complex. Other Orlando Florida area attractions include CFE Arena Church Street Station the Citrus Bowl Fashion Square Mall and Walt Disney World. You can dine at over 15 restaurants within walking distance of Hampton Inn - Suites Orlando-East-University of Central Florida hotel. Our Hampton Inn - Suites Orlando-East-Univ. of Central FL hotel features 76 hotel rooms and 34 suites 3-stories exercise facility heated outdoor saltwater pool and hot tub. Hotel amenities include complimentary hot breakfast buffet complimentary high-speed internet access in-room coffeemaker hair dryer iron and ironing board voicemail and 25-inch TV with full cable and HBO. Our Orlando Florida hotel also offers baby cribs. Laundry/valet services guest laundry meeting room and audio visual equipment are available at our Hampton Inn - Suites Orlando-East-UCF hotel for a nominal fee. We love having you here at the Hampton Inn - Suites Orlando-East-University of Central Florida hotel in Orlando Florida. all reservations must be guarantee with a major credit card or advance cash deposit to hotel regardless of time of arrival. all reservations must be cancelled by 24 hour host time unless deposit required. Policy is subject to change.